Please, note that Dark Chef can add new 7-segment digits to the beginning or the end of his score. But he is not allowed to end up with the score having leading zeros (except when the score is zero itself, see example case 6). Now he has received the score S, and he wants to increase his score as much as possible. But the maximum possible score government could give is M. So his score must not exceed M. Your task is to calculate the maximum possible score he could get after defacing. Note. 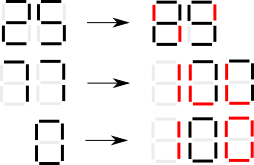 The digit "1" can not be changed to the digit "6", because in the representation of the digit "1" we have right 2 segments turned on, while for the digit "6" the upper-right segment must be turned off, see example case 12 for clarity. And, of course, the defaced score must be represented by the digits which have exactly the same form as shown in the above figure. The first line of the input contains an integer T denoting the number of test cases. The description of T test cases follows. The only line of each test case contains two space separated integers S and M, Dark Chef's score and the maximum score the government could give respectively. For each test case, output a single line containing the maximum possible score Dark Chef could get after defacing. The first three example cases correspond to the figure in the problem statement.